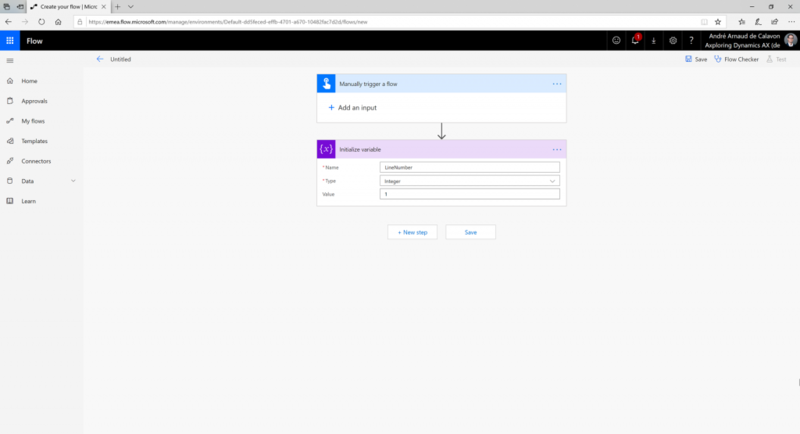 My previous blog was an introduction how to start using Microsoft Flow with the Microsoft Dynamics 365 for Finance and Operations connector. In this episode, I will elaborate on the Create a record action. How can you use this action and I will provide some related tips. E.g. how use line numbers which should be incremented? The template which I used in my previous blog used the create record action also. A screenshot of the basic part shows the most important fields for the Vendors entity. As you can see, you have to specify the environment as well as the entity to use. When these to values are specified, you will see a list of mandatory fields (marked with red asterisk). When the entity is company specific, you will also see a dataAreaId field. The Vendor account field in this example is mandatory in Microsoft Dynamics 365, but not in the entity. If you provide a value, it will be used as vendor ID. If you leave it blank, it will use logic to retrieve a number from the number sequence. When you want to create a Flow, you always have to start with a trigger. Triggers can be based on an event like a new mail message has been received. The previous blog used a recurrence. 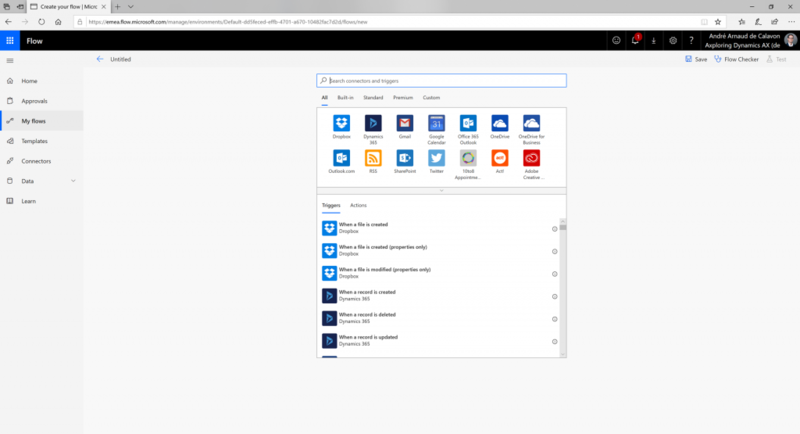 You can also install Flow on your mobile device and start Flows with a button. When the trigger has been inserted, you can continue with actions. Usually, you would read content from a certain application and bring data automated to a destination. One destination is the action Create record on the Dynamics 365 for Operations connector. When you add a new action, you can search with keywords for the correct action. You can use e.g. 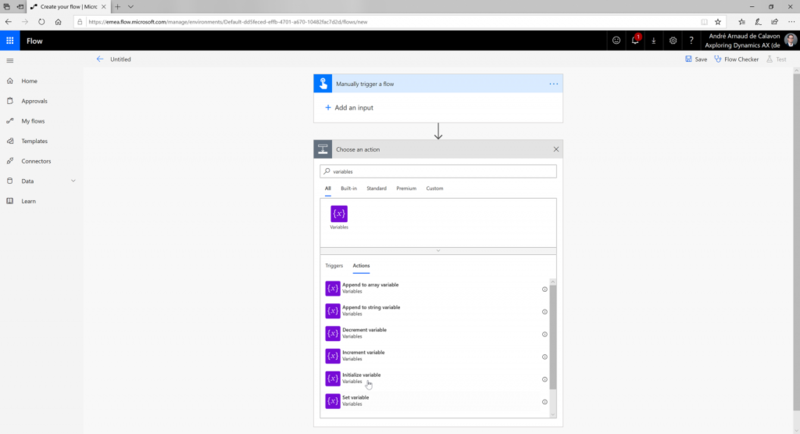 Operations, Dynamics 365 or a combination to narrow down the results. 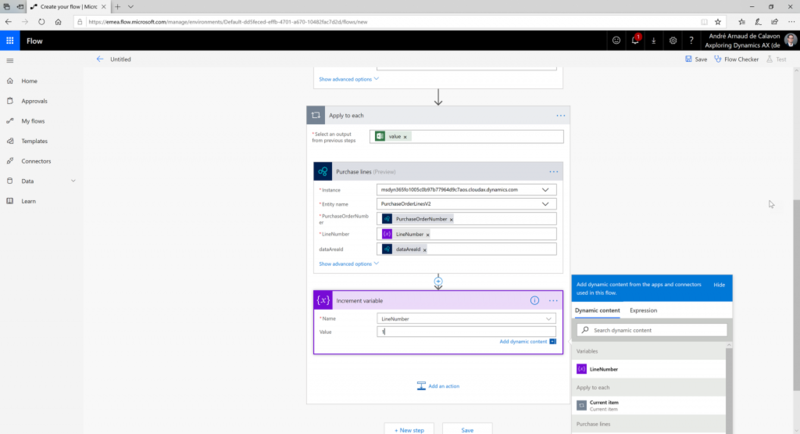 At the time of writing this blog, there is a trigger for Dynamics 365 for Finance and Operations in preview. I will elaborate about it in a future blog post. When you inserted the Create record action, you can choose the correct environment. Usually you will first choose a test or demo environment before actually use a production instance. The second required field is the entity. Flow will list all public entities. Some names are quite easy to find, like Vendors. 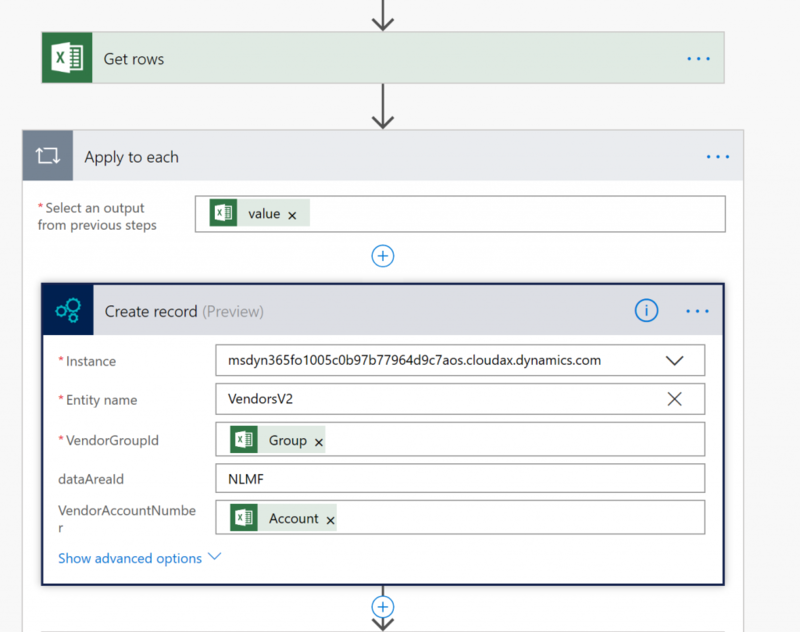 When you don’t know the name of the entity or cannot guess the correct name, you can open the form in Dynamics 365 and use the function Open in Excel. When the Excel sheet has been downloaded, you can then look in the design mode which entity is used. In some cases, there are multiple entities for the same table, but there is a version difference. For the vendors, there is a V2 version available. It is recommended to use the highest version number. Older versions will get depreciated in the future. In some cases, you get a error when typing an entity name. The connector is trying to find the correct entity as you type. When you have only a part of a keyword, it will mention that it could not find the entity. It is a bit annoying, but you can ignore this error when you are still in the process of selecting your entity. When you have selected the correct entity, there will be some mandatory fields listed. Then a field for the company (dataAreaId). It will then have a key field in case it is not mandatory. 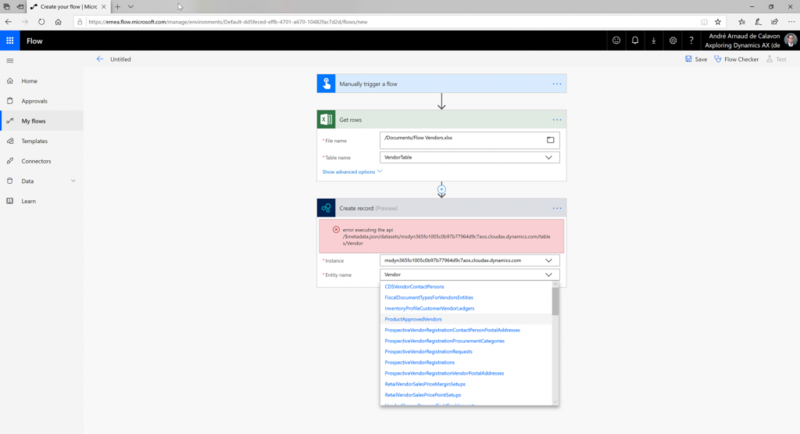 In this example, the vendor account number is not mandatory, but it is mandatory within Dynamics 365 itself. The reason for not having it mandatory is that you can leave this field empty. In that case, it will try to pick up a number from the number sequence. If you did not provide an account number and the number sequence is set to be manually, the flow execution will result in an error. To be able to use all other fields, you can click the option Show advanced options. It will list all other attributes in a non-alphabetical order. It would be nice if the field list has a certain structure, but in the current way, it is possible to map all fields. When you completed the flow, you can test and activate your task. How to use line numbers in Flow? A common question is how to use line numbers in Flow? 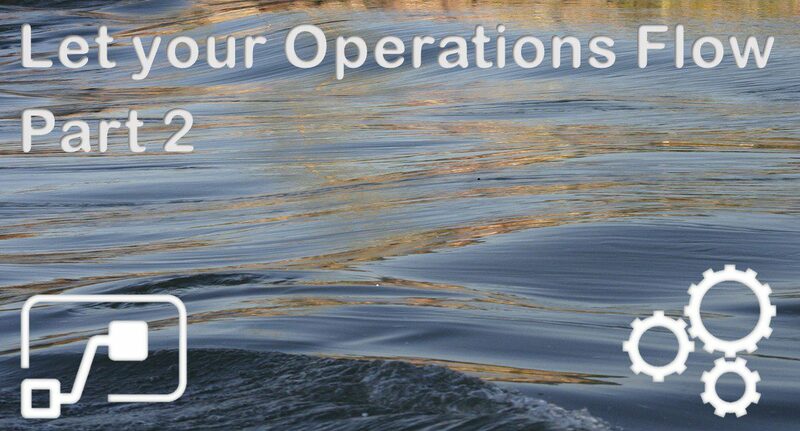 They are not automatically filled when you are using Flow or other Odata based tools to insert records. Flow can support in incremented integers by using Variable actions. Directly after the trigger, you can add Initialize variabele actions. You need to declare all variables that will be used in your Flow. For line numbers, you can use the Integer Type. The first value can be set to the Value 1 (or another value according to your preference). For a flow, e.g. importing purchase order lines from an Excel file, you can use the line numbers. There could be an option to increment with 1, 10 or other steps for the line numbering. How to use the line numbering an increment the value for the next line can be seen in the next screenshot. The purchase lines create record action has the variable LineNumber mapped as input for the LineNumber field. Then after the create action, the LineNumber will be inremented with the Value 1 in a Increment variable action. 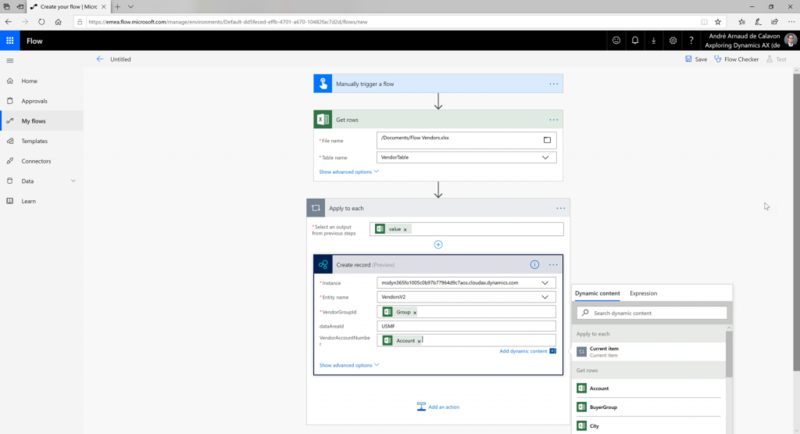 In this way, you can use line numbers provided by Flow if the business logic in Dynamics 365 for Finance and Operations is not automatically populate the Line number field. 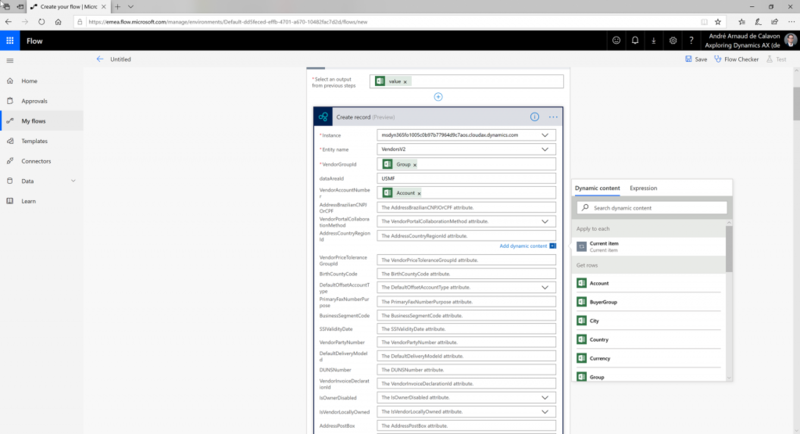 When you look at the screenshot above, you can notice that the purchase order number and data area fields are filled with Dynamics 365 fields. In this Flow, I did use a purchase order header entity to insert a new header record first. When the purchase order has been inserted, you can re-use the values in the Flow for other entity actions or providing a notification which order was inserted. 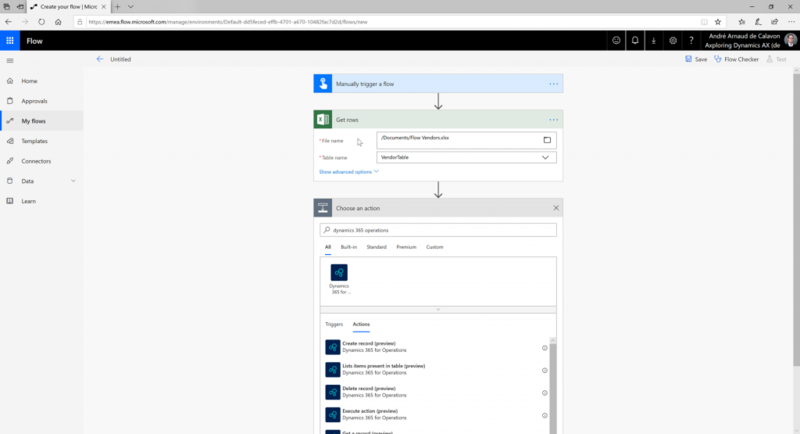 The next part (3) will inform you about the Dynamics 365 for Finance and Operations update action in Flow.